Monomoy Point Lighthouse in Chatham, Mass. On Monomoy Island South, on the southernmost tip. Lighthouse is part of Monomoy National Wildlife refuge with limited access to the area during the summer months. Native people are believed to have inhabited the Monomoy peninsula 6,000 to 8,000 years ago. The shoals around Monomoy Island are some of the worst in New England claiming many ships. Pollock Rip, an area of unusually strong tidal currents located off the southern shore of the island, historically caused numerous shipwrecks causing the need for a light station to be built to mark the area. 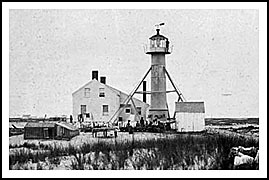 In 1823, Monomoy Light, the 40-foot, cast-iron tower lined in brick was built. Its primary purpose for helping to guide shipping traffic and mariners around the constantly shifting sandbars and shoals caused by those strong tidal currents at the end of Monomoy peninsula. Although Monomoy Light was in a very isolated location, there was an abundance of local food for the keepers. One Keeper converted his Model T Ford into what may be considered the ancestor of the early Dune Buggy of the 1970’s. The most well known shipwreck on the sandbanks was William Vanderbilt's 285-feet long Luxury Yacht, the Alva, in the summer morning of July of 1882 when they encountered dense fog and anchored the boat offshore to wait for the fog to clear. The 300-feet long freight steamer, H. F. Dimock, also caught in the fog, crashed into the yacht and destroyed it. Luckily no lives were lost as the crew of the Dimock rescued everyone on the yacht. Sometimes mistakes occur in communication between stations and boats, or panic ensues when those that are rescued become too frightened, ending up as tragic events. One of the worst disasters in the history of the Life Saving Service occurred on March 17, 1902, off the southern end of Monomoy Island, in the dangerous shoal called the Shovelful Shoal located near the Monomoy Lighthouse. This tragic event involved the senseless drowning of 12 persons, 7 of whom were members of the lifesaving crew of Monomoy Light. They were responding to a distress signal from the wrecked Wadena, that over previous days was in the process of being lifted off the shoal. With high gusting winds picking up creating dangerously high seas, it was believed that all crewmembers had been removed before the storm would come ashore. The keeper was never provided accurate communication that five men were still standed on the Wadena, and was obliged to risk his crew to save those on board the vessel. The crewmen from the stranded vessel panicked during the rescue with the high seas, and caused tragedy for themselves, and for members of the Monomoy Life Saving crew. When the Cape Cod Canal was completed in 1914, it diverted much of the shipping traffic away from Nantucket Sound, and caused the lighthouse to be dismantled in 1923. Beforehand, Monomoy was on the most convenient route for ships to reach southern New England. For a time afterwards in mid 1900’s, the Navy used the island for target practice. Luckily the buildings were not seriously damaged. In 1964 the Massachusetts Audubon Society helped to restore the lighthouse and its buildings. The Blizzard of 1978 cut the island in half and is now named as Monomoy North and Monomoy South. The area today is managed as a wildlife sanctuary. Chatham provides a quiet and enjoyable environment for visitors to the cape. 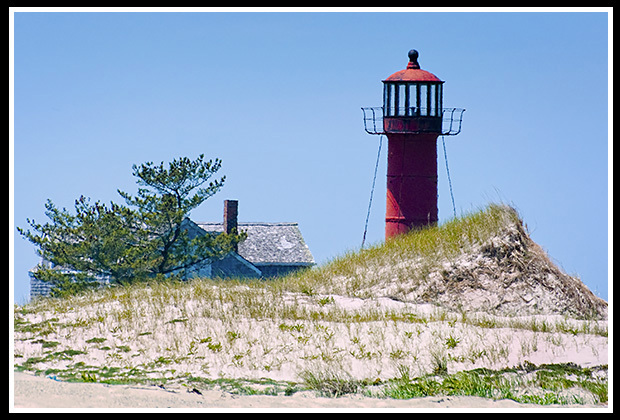 You can visit the Chatham Lighthouse and relax at nearby Chatham Beach. You can access the Monomoy Refuge Center through Chatham. For those visitors who enjoy a somewhat strenuous hike, the Monomoy Island Ferry will provide narrated wildlife tours that will drop visitors off to make the hike to the lighthouse and explore the Monomoy National Wildlife Refuge. For those who are not interested in hiking and looking to get a decent view from the water, take the Monomoy Island Excursions wildlife tour. Sometimes, during the summer months, it may be possible to spend the night in the light keeper's house with permission from the Friends of Monomoy. For the heroic hikers, you can now hike the 15 mile trek along the entire Monomoy island during low tide from Chatham to the lighthouse. Seals resting on the beach in front of the lighthouse. Monomoy is one of eight national wildlife refuges comprising the Eastern Massachusetts National Wildlife Refuge Complex. These eight ecologically diverse national wildlife refuges in eastern Massachusetts include Assabet River National Wildlife Refuge, Great Meadows Wildlife Refuge, Massasoit Wildlife Refuge, Mashpee Wildlife Refuge, Monomoy Wildlife Refuge, Nantucket Wildlife Refuge, Nomans Land Island Wildlife Refuge, and Oxbow National Wildlife Refuge. The Morris Island Hiking Trail nearby offers a small sampling of the unique wildlife of the Monomoy Islands and is the only section of Monomoy National Wildlife Refuge accessible by land. The Audubon Society of Wellfleet offers a variety of educational programs, and occasional guided tours of Wellfleet Bay Wildlife Sanctuary, Monomoy Wildlife Refuge, and the Cape Cod National Seashore. Visit the Cape Cod Museum of Natural History in Brewster, with 80 acres of conservation land with exhibits, nature trails, archaeology, and other events. To reach the refuge headquarters and visitor center on Morris Island, take U.S. Route 6 east to State Route 137 south to State Route 28. Take Route 28 east to the rotary in the center of Chatham. From the rotary take Main Street, up the hill to a T-intersection. Turn right and proceed past the Chatham Lighthouse and Coast Guard Station. Bear left after the lighthouse onto Morris Island Road, then take the first right. Follow Morris Island Road to signs for the refuge on the left. Boats mentioned below may offer many types of cruises. Both offer specific lighthouse cruises to see Monomoy Light from the water. 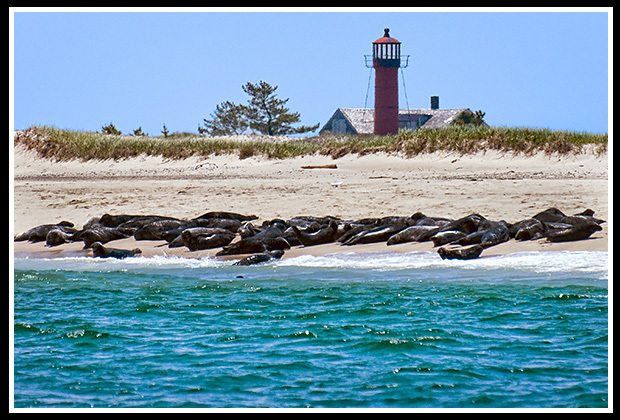 They offer wildlife refuge tours that pass by the Monomoy Point Lighthouse (see photo at top). They also offer wildlife and lighthouse tours around Chatham Lighthouse and Stage Harbor Lighthouse, and ferry passengers to Nantucket Island. Wildlife refuge tours visit the Monomoy Point Lighthouse, minimum 6 passengers. 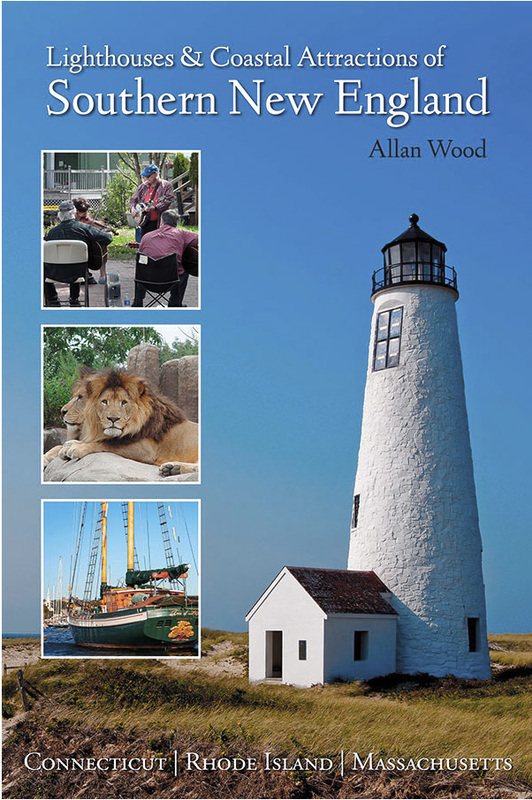 Explore my book, Lighthouses and Coastal Attractions of Southern New England: Connecticut, Rhode Island, and Massachusetts. Providing special stories from each of the 92 lighthouses, along with plenty of indoor and outdoor coastal attractions and tours you can explore. There are stories from each lighthouse in the Cape Cod region. At Monomoy light, you'll find more deatils regarding the story about the "Monomoy Tragedy" that could have been avoided for the Monomoy Lifesaver crew, where most of the members perished during a rescue attempt.